Leadership ICMA is a competitive, intensive two-year ICMA University program designed to cultivate key competencies needed for successful leadership at all levels of local government management. Participants not yet eligible for credentialing join a class of select individuals to complete a series of five class modules and a team-based capstone project. All Leadership ICMA graduates receive one year of experience "credit" toward the ICMA Voluntary Credentialing Program. The program has graduated its thirteenth cohort and welcomed the Class of 2020, with members of the class of 2019 working on capstone projects hosted by the cities of Boulder CO, Frisco TX, Georgetown TX and Twin Falls ID. We are now accepting applications for the Class of 2021. Applications are being accepted on a rolling basis through September 30, 2019. Successful completion of the program is celebrated with a special certificate and membership in the Leadership ICMA Alumni Association. The small classes encourage a strong learning community. The initial orientation and team-building session is held in Washington, D.C., in mid-December. Participants later attend University of Virginia's Senior Executive Institute in May or June. The capstone project preparation meeting is held the next January or February at Arizona State University. Other travel is to work on small-group projects and meet at the ICMA Annual Conference two to three times. Participants also communicate through monthly conference calls and online discussions. The program facilitates networking within the profession and enhances connections between local government managers and their professional association. Applicants must be ICMA members and have at least three years of senior management experience in local government or a related field with experience in multiple departments. They must have completed the ICMA Applied Knowledge Assessment for their own edification. (Results of the assessment remain confidential and are not considered in the review of applications.) Employers must sign a commitment form confirming their willingness to support the educational and travel costs associated with this program. Class modules are scheduled over the course of the two-year period, including a capstone project that requires participants to demonstrate their competence in the concepts presented throughout the Leadership ICMA program. Each module requires considerable preparation through assigned readings, full attendance, and completion of written assignments that demonstrate a grasp of the subject matter in advance of the module. 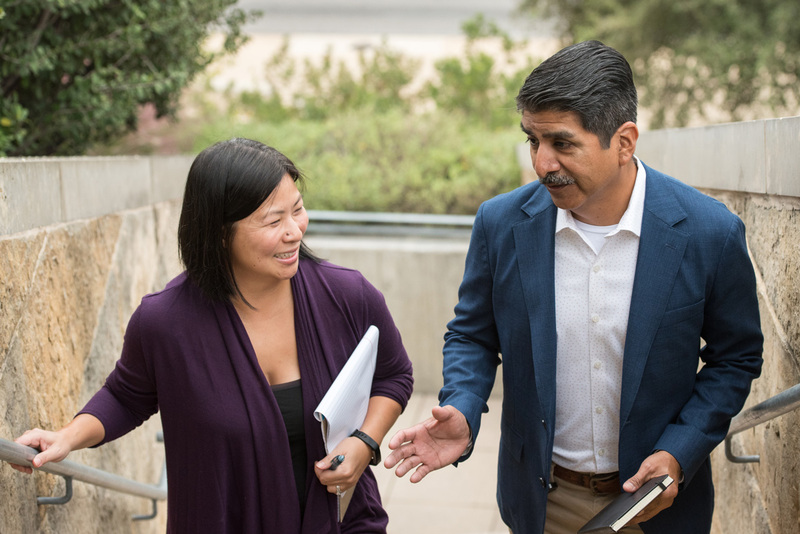 Faculty include well-respected academics who teach in public administration programs and premier local government executive institutes, local government practitioners, and other content experts. Module 1: Leadership Philosophy and the Essence of Public Service. Participants engage in a variety of team-building activities designed to develop a solid foundation for positive, honest, and collaborative engagement over the course of the Leadership ICMA program. This is complemented by an intensive overview of democratic values, leadership philosophies, and the value of professional management in a rapidly changing world. This highly interactive session is led by Felicia Logan, ICMA director of Leadership Development. Module 2: Understanding the Code of Ethics and its Practical Application. The Integrity/Ethics component of this module has its basis in the ICMA Code of Ethics and its practical applications in modern local government management. There is heavy focus on case studies and role-playing exercises. This session is led by Elizabeth Kellar, ICMA ethics advisor and deputy director. Module 3: Giving Voice to Leadership: Understanding the Role of Policy Administration and Advocacy. Key to understanding and appreciating the role of the elected official is the ability to understand the relationship between policy and administration. Through readings, case studies, and examples from local governments represented in the class, participants learn to better understand this unique relationship. Skills honed in this module include facilitating the flow of ideas, information, and understanding between and among individuals; advocating effectively in the common interest; communicating support for policies, programs, or ideals that serve the best interest of the community; and balancing the needs and demands of competing advocacy groups through negotiation. This module is presented in partnership with the Senior Executive Institute at the Weldon Cooper Center of the University of Virginia. Module 4: Organizational Effectiveness and Team Building. This module, completed in the second year, focuses on the practical concerns and skills of a high performance organization—the tools needed to help the local government become known for leadership at all levels, vision that is connected to values, high standards of quality, delivery of customer “value,” and strong financial performance. Module 5: Strategic Planning and Project Management. Strategic planning capabilities are critical to playing an effective leadership role. This module, also completed in the second year, focuses on skills necessary to position the organization and the community for events and circumstances that are anticipated in the future, including the ability to analyze and facilitate good policy choices. Module 6: ICMA 101. This module provides participants with an understanding of ICMA’s mission, history, goals, organization, services, products, and opportunities for member involvement. Leadership ICMA participants are invited to actively engage in a leadership role within the association by serving on task forces, convening member groups for discussion of key issues, leading educational or informational sessions at the ICMA conference or regional meetings, or participating in an international project or exchange. The capstone project requires participants to demonstrate their competence in the concepts presented throughout the Leadership ICMA program. Working in teams, participants work on a local government consulting project solicited through a formal RFP process with a local government client. Through a series of facilitated exercises, participants are individually and collectively evaluated to determine whether they have met the criteria for graduation. *It is difficult for ICMA to provide a useful estimate of travel costs since they are different for every participant depending upon initial travel location, but potential applicants should feel free to look up hotel and airfare costs (and estimate time out of the office) based on the information below. The initial orientation and team-building session is held in Washington, D.C., in early-December for three nights. Participants later attend the University of Virginia's Senior Executive Institute (SEI) in May or June for eight days. There is a $650 program fee for SEI. (ICMA pays the remaining tuition cost of $2,800 per person.) Last year, lodging and meals for that event were $1,550 per person, not including airfare. The capstone project preparation meeting is held the next January or February at Arizona State University for three nights. Other travel is to work on small-group projects (travel paid by host cities) and meet at the ICMA Annual Conference two to three times (participants are responsible for registration, lodging, and travel costs). The staff, members, and alum of Leadership ICMA would like to thank ICMA-RC and the Leadership ICMA Legacy Fund (Class of 2010) for their generous support of our program. ICMA-RC’s contributions will ensure that Leadership ICMA as a whole can continue to offer younger generations of local government professionals incredible leadership development opportunities. The Leadership Legacy Fund’s contribution is designated to ensure that each participant - now and in the future - has the financial resources available to take advantage of all of the program’s components, regardless of budget cuts in their jurisdictions or changes in their employment. Thanks to the Leadership ICMA Legacy Fund, scholarships to cover the cost of tuition will be available. We are so grateful to partner with each of these organizations.